It’s hard to say what resurrects the popularity of certain musical styles, but for whatever reason, the nearly 90-year- old Hot Club of France sound has become hotter than ever in 2017. Just ask French-born musician Julien Labro, who will lead the Hot Club of France Tribute Band that swings into Vail this week. “Over the past 15 years or so, the Hot Club style has had some sort of resurgence, especially in North America,” says Labro, who’s won numerous international awards for his arrangements and compositions, has collaborated with everyone from Grammy winning pianist Fernando Otero to American jazz guitar icon Bucky Pizzarelli and has released 10 of his own studio albums. Historically, the Hot Club de France was founded in 1930 by a group of student jazz enthusiasts who essentially put jazz music on the map in France and gave rise to international icon Django Reinhardt. Labro believes the re-launched mainstream status of the Hot Club sound, particularly in the U.S., is likely due to its current use in numerous film and T.V. series soundtracks and commercials. Guitarist and Vail Jazz favorite Frank Vignola put the Hot Club of France Tribute band together, featuring his six-string partner in crime Vinny Raniolo and bassist Gary Mazzaroppi, who together with Vignola performed for a number of years with guitar legend Les Paul. Recovering from a car accident this spring, Vignola will sadly not accompany his Hot Club of France Tribute on its tour through Vail. Labro will take the reins as bandleader. As for Labro’s part, he has been playing the accordion since he was a small boy. He explains how the instrument’s allure instantly drew him in like a tractor beam. 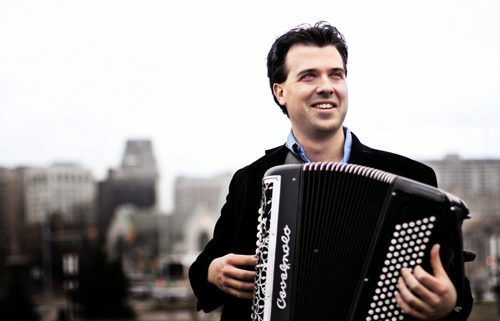 “I grew up in France where the accordion is very much present in the culture and musical landscape. At age 9, I saw a TV program that featured an accordion player backing up a singer. I was really mesmerized at the sights and sounds of the instrument … all the shining buttons reflecting the light and the swaying back and forth of the bellows. I immediately wanted to get my hands on one to simulate what I saw,” he recalls. 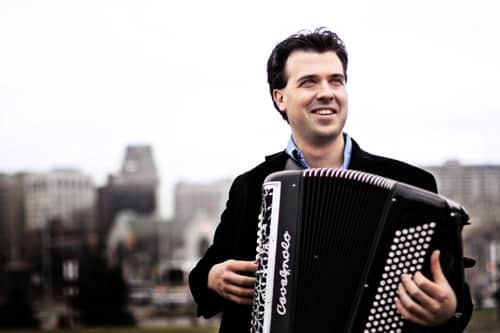 He explains how the accordion etched its role in France in the 1920s and 30s as the centerpiece of the ‘Musette’ sound, in which it served as the centerpiece of a tune as the guitar, bass, drums and banjo carried the rhythm. According to Labro, the genre was most popular with blue-collar crowds in Parisian bars and dance halls. Then, Django Reinhardt entered the mix. “Django Reinhardt, looking for work at the time, quickly became the favorite of the accordion bandleaders. His incredible abilities and formidable ear and technique allowed him to match the tricky accordion riffs,” Labro explains, adding that after Reinhardt and violinist Stéphane Grappelli were discovered by the Hot Club of France, they formed their famous quintet. “While the quintet did not have an accordion in its instrumentation, you can clearly hear Django’s musical vocabulary influenced by his early years playing with accordion players,” Labro says. The Hot Club of France Tribute quintet presents a retrospective of Django Reinhardt and Stéphane Grappelli’s music as well as jazz standards in Hot Club style during two intimate club performances on Wednesday in Vail and then in energetic, breakneck fashion in Vail Square in Lionshead on Thursday. The Hot Club of France Tribute brings its intricate, intimate ballads to Ludwig’s Terrace in The Sonnenalp Hotel. The first show begins at 6:30 p.m. (doors at 6 p.m.) and the second show begins at 9 p.m. (doors at 8:30 p.m.). Tickets are $40. Drink and dinner service are available for purchase. The Hot Club of France Tribute ramps up to the Django Reinhardt tradition of high- speed rhythms for an energetic performance for Vail Jazz @Vail Square at 6 p.m. General admission tickets are $25, preferred seats $40 and premium seats $50. Presented by The Jazz Cruise and Blue Note at Sea, Vail Jazz @ Vail Square takes place every Thursday evening through Aug. 24 in the all-weather Jazz Tent in The Arrabelle courtyard in Lionshead. Drinks are available for purchase. For tickets or more information visit vailjazz.org/tickets or call 888-VAIL- JAM.